Have you gotten a call from your employees that a broken pipe, appliance failure or sprinkler line has failed? Even worse, that failure has caused a large amount of damage to the commercial building. In fact, multiple floors have been affected and water is dripping down the walls. You know you need to act fast and call in the professionals that can get your business back up and running quickly! When you call Kelley Klean Restoration and Cleaning services, we follow a specific and detailed process when mitigating a commercial structure. We understand that for you, time is money, and we will act quickly to get you back in business. We are committed to investing in the latest technologies and tools to help speed up the extraction and drying process. Certified by the IICRC (The Institute of Inspection, Cleaning, and Restoration). The contractor of choice in Mid-Missouri, we service the Columbia, Jefferson City, and Central Missouri areas. As soon as our technicians arrive at the site, they start by assessing the damage. At Kelley Klean, we equip our technicians with the right tools to identify even the water that has migrated beyond what is obvious to the naked eye. We closely and carefully follow the path of water flow and try to identify the actual damage due to water ingress. We also assess the secondary damage to the property due to water leakage. Once the analysis of the site is complete, the next step is to decide on a drying strategy that is approved by our client before starting the work on your property. Next, we start removing the standing water. During this stage, we use the most modern techniques and tools to remove almost 99% of the water from the site. The step will prepare the affected areas for drying equipment such as air movers, and dehumidifiers. Once the standing water gets removed, the next stage is the drying process. For this, we use equipment as dehumidifiers, air blowers, and the air filtration devices. The work is planned such that the dehumidifiers get placed in the center of the affected area, and the air movers are placed equally at every 10-16 feet around the perimeter of the location. As the drying process continues, we take the regular moisture readings each day. These readings indicate the effectiveness of the drying process and enable us to take corrective actions if the situation demands. We also provide these readings to your insurance company to help support our proposed drying strategy and to prove the drying process is working. It is always our effort to mobilize quickly and try to save as much of the building content and materials as possible. But many times the particular situations at the site do not allow us to save everything and damage do occurs. In such cases, our experts are experienced to remove selectively the affected areas and do the restoration such that the repaired parts will match the original. As part of our service package, we take up all the jobs starting from drying to the restoration of damaged property. 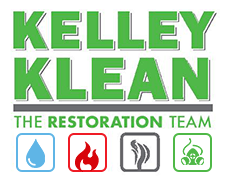 With Kelley Klean restoration, we can handle the entire water damage process from start to finish, leaving the stress off of your plate. If the water damage occurs to your property, you may not like the idea of calling multiple restoration companies and taking different quotes from various works. This is bad planning as the longer you wait to finalize things, more will be the damage to property due to water, thereby increasing the time and cost of restoration into multifold. It will also increase the secondary damage to the property and its contents. To avoid this, we at Kelley Klean can provide the pre-disaster planning services. It is similar to doing your homework before the event. We have done this by working over the past decades with some big clients, and with our experience, we can say that it pays to be well prepared. We make the plan by analyzing each square foot of your property, assessing the possible damages, identifying the locations that get used for setting up the equipment, etc. As every possible water damage case is different, so we typically provide the per square foot rates for the restoration work to the clients. Our dispatchers are standing by to take your call. Keep in mind, we can also help you with residential water damage. To learn more about how we can restore your commercial property after water damage, give us a call at 573-214-099!